Why Knight Tubs and a Jacuzzi Hot Tub? There are a lot of different reasons to visit us and see the Jacuzzi difference. I assume by now you have done a little research, and by now you have probably generated some questions. How many places have you contacted and were unable to give clear, concise answers to your questions? How many people did you talk to who didn’t even answer your questions and just beat around the bush? It’s frustrating. We know it is. This is a big purchase and you should be properly informed. We’re here for you. That is why when you call us, we will have the answers you are looking for. There is no replacement for experience in all areas of hot tub ownership. It doesn’t matter if you are looking for service-related information or reasons to buy a new hot tub. We want to help. We are happy to give you the hands-on experience today’s consumer desires. This means clean, current model hot tubs full of water and ready for you to try out. This means the proper parts and supplies you demand to keep your Jacuzzi running at it’s best. And this also means having someone willing to put in the time to show you how to use that brand new Jacuzzi you just put in your backyard. 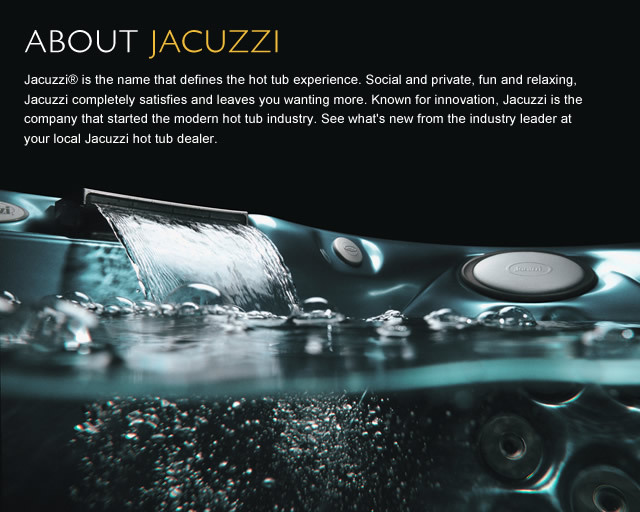 Jacuzzi believes baths and spas are about more than just getting clean, so we provide high-performance products that celebrate water’s ability to refresh and rejuvenate in inspiring ways. Our product innovations are sparked by consumer insights and needs and we constantly strive to deliver experiences that enable you to transition to a better state of mind and body.